"Successful people have a clear future orientation. They think five, ten and twenty years out into the future. They analyse their choices and behaviours in the present to make sure that what they are doing today is consistent with the long-term future that they desire." If you've spent five minutes around here lately you should know that I am absolutely on one when it comes to goals and productivity. Having turned 25 and had a mild meltdown over the possibility of my dreams and ambitions passing me by, I've spent a lot of time recently looking into different methods of tracking goals and trying to figure out how to fit in all the different things I want to pursue. After a few months of trial and error and making lists in my A3 visual diary, I think I've finally reached a point where I have my method down, and I am here today to share the magic with you. Obviously different methods work for different people, but regardless of whether you're a pedantic list maker or more of a pick-one-thing-and-go-for-it kind of person, I'm sure there'll be something vaguely helpful to take away. One of the most important systems I've put in place is having different tiers of goals. 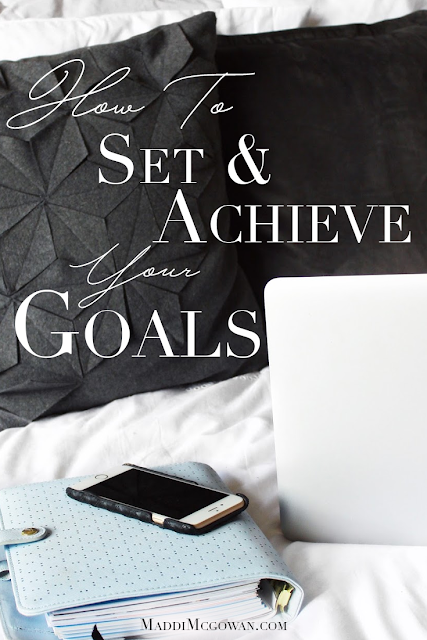 I have my big overall life goals and my goals for the year, but I also have goals for each month and week, to keep track of the bigger ones and work in smaller ones that are more relevant at a particular point in time. The easiest way to illustrate this is to break down all the different levels of goals I have on the go, so enjoy. Love a fresh start, love a resolution. These are different from the rest of the categories in that they're more related to my state of being rather than my achievements. I tend to choose resolutions that will set the tone for my year, for instance 'follow through and finish things' or 'stick to a good routine that prioritises wellbeing, efficiency and quality time' rather than concrete ones like 'read 40 books'. At the end of each year I reassess what changes I need to make in the fundamental way I approach my life, and those are what I'll base my resolutions on. Purpose: Stay on track to fulfil my biggest goals & minimise regret; clarify overall direction and where I should be directing energy. These are the big daddies. We're talking what do I need to have achieved in five years time in order to be genuinely satisfied with my life. This is the list that I find takes the most genuine introspection, because you have to be honest with yourself about what is actually most important to you, and often those goals are quite intimidating. However, this is one of the most important lists to make because you can't work towards your goals if you don't know what they are. To give you an idea of scope, my overall goals are things like building a sustainable writing career and deciding how I want to pursue music - things with considerable bearing on my future. Most of my other big goals (own a house, travel to specific places etc.) could be achieved immediately with money, so I leave them out because they don't need the same kind of attention. It's also worth noting I am in a secure long-term relationship, otherwise boy schemes would definitely feature here. Just being real. Purpose: Make large goals more manageable & create a timeline to work towards multiple big goals at once. This is not so much a set of goals as a route to reaching them. Once I had my three big long-term goals written down I worked backwards to figure out the steps I'd need to take to reach them, and then organised those steps into phases. For instance Phase One contained the beginning steps for all three goals, like plotting my novel, organising my lyrics and finishing my work website. Phase Two is comprised of the next steps, like actually writing the novel, arranging the music for my songs and onboarding a certain number of new clients. My goals all fit into four phases of different lengths, but you can break yours down however makes the most sense. I allocated a set amount of months for each phase, varying depending on how big the tasks within it were, and some tasks - like writing a book - span multiple phases. Purpose: Keep big goals on track as well as adding in other necessary tasks and smaller projects. My monthly goals consist of whatever needs to be done for that phase of my big goals, as well as anything else I want to focus on for smaller projects or more immediate things going on in my life. You can see examples of my monthly goals in my Grand Scheme posts, and there are usually quite a few of them spanning my work, personal life and projects. Of all the tiers, monthly goals are the place to go wild, because you do have an entire month to cover them and anything you can't fit into the weekly or daily lists can just be delegated to the next month. 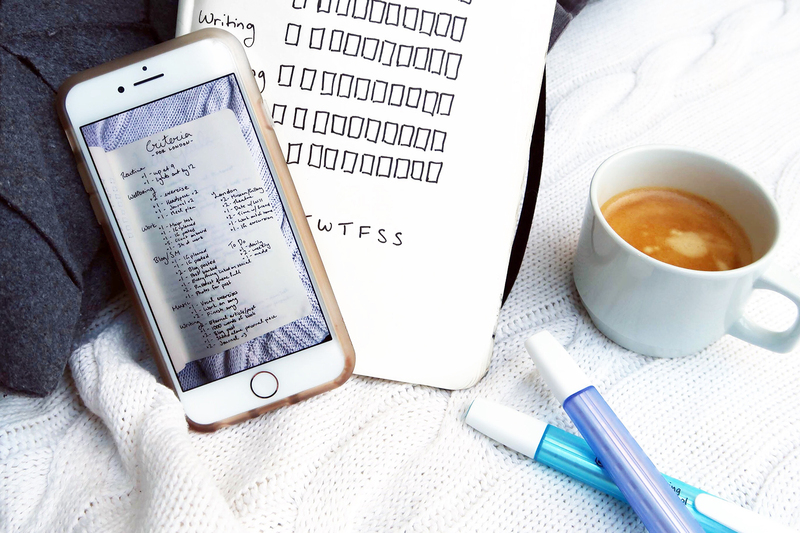 Purpose: Organise monthly goals and make them more manageable. I generally decide on my weekly objectives on a Sunday by looking at my list of monthly goals and seeing what jumps out at me as either needing to be done most urgently or making sense grouped and completed together, and then factoring in my plans for the week. In addition to making sure I get my monthly goals ticked off, sometimes I'll also give my weeks an overall theme like mindset, admin, work or creative projects and go from there. This is where it starts being vital to think realistically about how much you can fit in, because it's better to get five big things done properly than start 15 and get too overwhelmed to finish any of them. Purpose: Breaking down my weekly objectives into individual tasks and making sure there is realistic time assigned for everything. My daily to do lists generally consist of 3 items, which I've found over time works best for me. Sometimes it'll be more, but I never go over 5 because once you start loading too much onto a single day it's a lot harder to get everything done properly. This is not a list of every tiny thing I need to get done (for example I wouldn't include things like 'make the bed' or 'go to the supermarket'), just the big tasks that will actually require energy and attention to get done. One thing I do include in these 3-5 items is social commitments, because 1. they're worthwhile and 2. they take up time that I then don't have to spare for another large task. Mini recurring daily tasks (meditation, exercise, practicing an instrument) do not go on your main to do list, but should be kept track of. I track mine at the bottom of my Sims Chart, which I'll be sharing with you in a few posts' time. I also prioritise my weekly and daily tasks using the ABC method which will be explained below. My main advice for goal setting is that you have to be very honest with yourself. If you lack self awareness or are too self-conscious to even admit your goals to yourself then chances are you won't achieve them. If you're feeling blocked for some reason, I find it helpful to ask the following questions: What is holding me back? What sets the speed at which I achieve my goals? Why aren't I at my goal already? Those questions are from a book called Eat That Frog by Brian Tracy, which you will have seen me singing the praises of on my work instagram, and it's one of the most valuable resources I've ever come across in terms of goals and productivity. I read it in one go on my phone and I definitely recommend giving it a go if you're looking for some slightly more professional guidance. That being said, I'll save the productivity side of things for a separate post, but here are some of my favourite goal-based tips from Eat That Frog. In thirty seconds, write down your three most important goals in life right now. The "thirty seconds" part is the key, because you'll be more likely to go with your real instincts, and studies have shown that the answers you give within thirty seconds are just as accurate (if not more so) than the ones you come up with in half an hour. "20% of your activities will account for 80% of your results", so be smart with where you spend your energy. I prioritise my to do lists using The ABC Method. This works best with longer lists, particularly weekly ones, and all you need to do is assign each item a letter. Be realistic. The key to this is actually following the order you've assigned - start and FINISH your A1 task first. A - Important, must do. A1, A2, A3. B - Should do, mild consequences. C - Would be nice to do, no consequences. D - Can be delegated. E - Can be eliminated. So that's it! It may seem like a lot at a glance, but realistically you only need to set the big goals once a year - if that - so the only lists you're keeping up on a regular basis are your monthly goals and weekly tasks. Getting the bigger picture things sorted is the most daunting part by far, but if you invest a bit of time and energy into doing it properly it makes everything else so much more clear and easy to execute. If you're curious about my specific ongoing goals make sure to keep up with my Grand Scheme (most recent update here), and let me know if you find any of this helpful/decide to make your own crazy person hierarchy of goals. I'll be writing another post similar to this about productivity in the near future and yet another letting you in on the groundbreaking invention that is my Sims Chart, so keep an eye out for those. For now I'm off to move tables in this cafe, because it is one million degrees in London and I am sitting in the sun.